"Painting has never been a career or a job, it has always been something that I would do just for my own pleasure. Painting is a﻿n evolutionary process - my style changing unnoticeably on a daily basis however, I never see this change just as we do not notice our children growing on a daily basis....but don't they grow up quickly!" ﻿Stephen Lees Original Contemporary Art is nestled in the heart of the New Forest, surrounded by breath-taking scenery and a coastline of unimaginable beauty. From his Lymington ‘Gallery on the Cobbles’, Stephen takes inspiration from all around him to produce contemporary interpretations of British seascapes, landscapes and abstract paintings, which are characterised by a vivid use of colour & richly textured acrylics. Stephen’s style is unique and highly recognisable and, together with his distinct subject matter, produces artwork of power and sublime, aesthetic appeal. Since opening his intimate 'Gallery on the Cobbles' Stephen has quickly become established as one of the South’s most celebrated & respected marine artists, producing artwork for the likes of multiple Olympic medallist, Ben Ainslie. However, despite his rising status in the art world, Stephen’s gallery is refreshingly unpretentious and relaxed and everyone is made to feel welcome, as they step inside. Stephen produces affordable, original artwork so you can wonder into his gallery and walk away with a stunning piece of artwork that doesn’t cost the earth. Stephen also offers something quite unique in that he will customise your painting with your choice of colour or a date; a name or a detail. You can even join in the painting experience, alongside Stephen, to produce a complete ‘one off’ that ‘tells a tale’ and will mean so much more. Alongside his artwork collection, Stephen also offers a range of limited edition prints which are signed, numbered, framed in limed oak and ready to hang. Along with gift vouchers that are always available, Stephen has also launched a new range of homeware statement pieces including British sourced and handmade lampshades, table lamps, mugs and cushions, all adorned with his artwork. 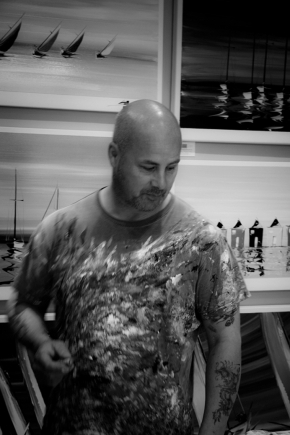 Take some time to peruse through Stephen’s website or take a leisurely stroll down the cobbles to the gallery and meet the man who is fast becoming one of the most innovative and exciting contemporary marine artists of our time.